Get Psyched for ‘Captain America: Civil War’ With New Photos! We’re less than a week away from opening day for Captain America: Civil War, and if you need any more help getting excited for this blockbuster, just take a peek at these photos Marvel Studios and Disney have unleashed upon an already-rabid fandom. CBS has released these new images and a plot summary for the second episode of SUPERGIRL, “Stronger Together,” airing tomorrow, Nov. 2. When Kara’s attempts to help National City don’t go according to plan, she must put aside the doubts that she — and the city’s media — has about her abilities in order to capture an escapee from the Kryptonian prison, Fort Rozz. Also, Cat pressures James to use his connection to Superman to get her an interview with Supergirl. The episode marks the show’s debut in its regular time slot, 8 p.m. Mondays. Actress Helena Bonham Carter cozied up with an endangered bigeye tuna to promote the creation of marine reserves in the UK Overseas Territories. “I am a big supporter of protecting the marine environment,” Carter said of the Fishlove campaign promoting the Blue Marine Foundation, which raises awareness of “the unsustainable fishing practices that are destroying the earth’s marine ecosystem.” And it’s not just fish; the reserves would help whales, turtles, seabirds, penguins and corals. What’s Going on With ‘Mummy on the Orient Express’? This weekend’s new episode of DOCTOR WHO, “Mummy on the Orient Express,” is supposed to be very scary — but it’s also something of a mystery: Is the Doctor (Peter Capaldi) traveling without Clara (Jenna Coleman)? 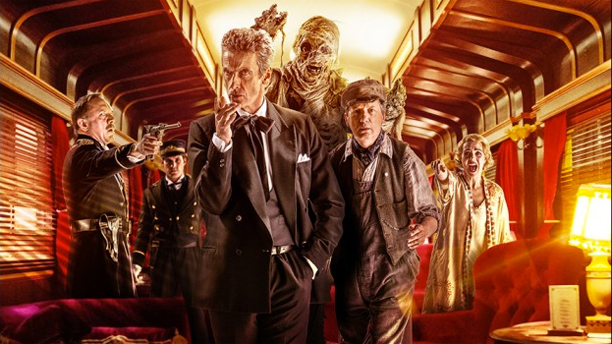 The promotional images for the story notably include no shots of Clara on the train. And we all know she sent him packing at the end of last week’s “Kill the Moon,” so is he off sulking? Hit the jump for a collection of photos from “Mummy on the Orient Express,” featuring guest turns by comedian Frank Skinner (as the engineer chap) and singer Foxes (as the… er, singer) — and some intriguing descriptions of the storyline. The Doctor: Let’s Rob a Bank! This collection of promotional photos for the DOCTOR WHO episode “Listen” come courtesy of BBC America, which will be airing the episode Saturday at 9 p.m.